Enjoy these amenities and more at Solterra Resort, only 9.5 miles to the gates of Disney World® and 3 miles from Reunion. Discount conditions: Must meet minimum night stay for the season. Cannot be combined with other discounts or specials. Must be requested at time of reservation. Only valid on new reservations for arrivals and departures between now until July 31, 2019. Not valid during peak or holiday seasons. Subject to change and availability. 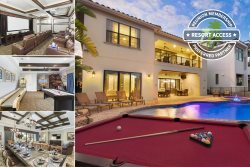 Located just minutes from Orlando's theme parks, shopping, dining, and other area attractions, this luxury villa is located in Solterra Resort. Solterra Resort is just a 5 minute (2.5-mile) drive from a supermarket and other shopping. There is also an IMAX movie theater and additional shopping, such as Target located at Posner Park, just a 7 minute (4.2-mile) drive away. Enjoy unlimited access to resort amenities such as a state-of-the-art clubhouse, resort pool, hot tub, fitness center, lazy river, tennis & volleyball courts, children's playground, and recreational area. Enjoy food and cool drinks at the poolside café, perhaps a frozen cocktail? This 6-bedroom villa has a modern, spacious interior where the whole family can gather. The open area great-room includes soft sofas facing the TV, casual dining table with seating for 6 along with additional seating by the kitchen countertop. A table for fine dining seat 6. The modern kitchen with sleek granite counters comes fully stocked with appliances needed for a homecooked meal. Enjoy poolside meals with table seating for 6, or relax in one of the sun loungers to soak in some of the Florida Sun. A spillover spa adds additional relaxation. The pool and extra large pool deck have a southern exposure, maximizing your sunny vacation days before the private view facing a nature preserve. Please note it is not permitted to host parties or group events such as weddings in this vacation home. A mandatory refundable (subject to post-departure inspection) security deposit of $750 is required. Failure to pay the security deposit will lead to a cancellation of the reservation. Please note, some of the bedrooms in this home are designed to accommodate children, it does not accommodate 22 adults. This home sleeps 16 adults, the rest are bedrooms for designed for children 16 and under. Please note this home does not provide access to a garage. The complimentary BBQ grill is provided free of charge. Reunion Vacation Homes and/or the Owner do not accept liability for equipment failure. It is the guests' responsibility to clean and maintain the barbecue and replenish Propane for the BBQ as required. This ultimate family vacation rental community is located in the Kissimmee area with easy access to Orlando's theme parks, dining, and shopping. Designed with tranquility and relaxation in mind, you can enjoy your recreational activities right at the resort. Solterra Resort Vacation Home Rentals Close to Disney World, Orlando Florida. The ultimate family vacation destination.